Julie Webb discovers that one of the Braunston Rally’s regulars is a skater as well as a boater. THE day I interviewed David Daines, in the snug saloon of his 1935 motor boat Cyprus at her moorings by Cow Roast on the GU, he was supposed to be having an ice dancing lesson in Guildford. He’s been skating for 50 years – he’s now 72 – and met his wife Sue at the rink. Apart from skating, and Sue, his passions are railways and canals. 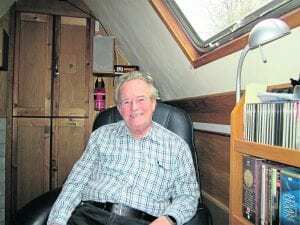 He’s been a leading light in the promotion of interest in historic narrowboats since the 1980s, when he was, as he put it, ‘tricked’ into becoming secretary of the Narrow Boat Owners Club. This became, in 1989, the Historic Narrow Boat Owners Club and, in its latest incarnation, the Historic Narrow Boat Club; a change he’s pleased to have been involved with. “It had been very exclusive. You needed to own at least half a hull to join. 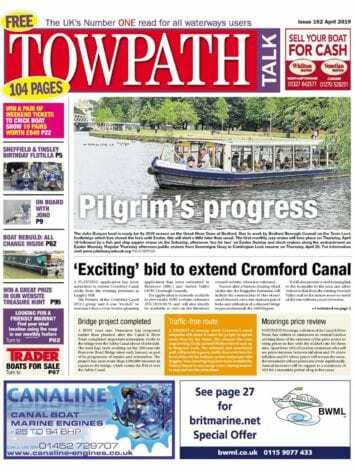 A lot of people interested in historic narrowboats aren’t fortunate enough to own them – they have financial or family constraints,” said David, who has been its chairman and membership secretary and is still on HNBC’s committee as South East representative. He also serves on the Canal & River Trust’s South East Boating Sub-group. His childhood home was in Southend but he wasn’t brought up with boats. In 1981 he bought his friends out. “It was a good little boat but it did actually sink on me,” he said. “The water in the bilge froze and pushed the caulking out.” He raised it, with help, but started looking for something more robust. In 1983 he bought Lynx, an ex-GUCCC butty converted to motor. He kept her until 2001 and travelled extensively, and mainly single-handedly, around the system, doing some heroic journeys – such as almost the whole of the Worcester & Birmingham in a day. On one occasion he ventured from Worksop up the tidal Trent, braving the tricky entrance off the tideway into Cromwell Lock, and the dangers of its vast, then unprotected, weir. He also took a commercial load – engineering bricks – from Yorkshire down to Aylesbury. The logistics of lifting them in and out proved far from straightforward and he found himself having to hand-unload. Lynx also made a memorable appearance at the first Braunston Boat Show, where she found herself accidentally leading the historic boat parade – following a different route from that prescribed by the organisers (the route, however, that they follow today). 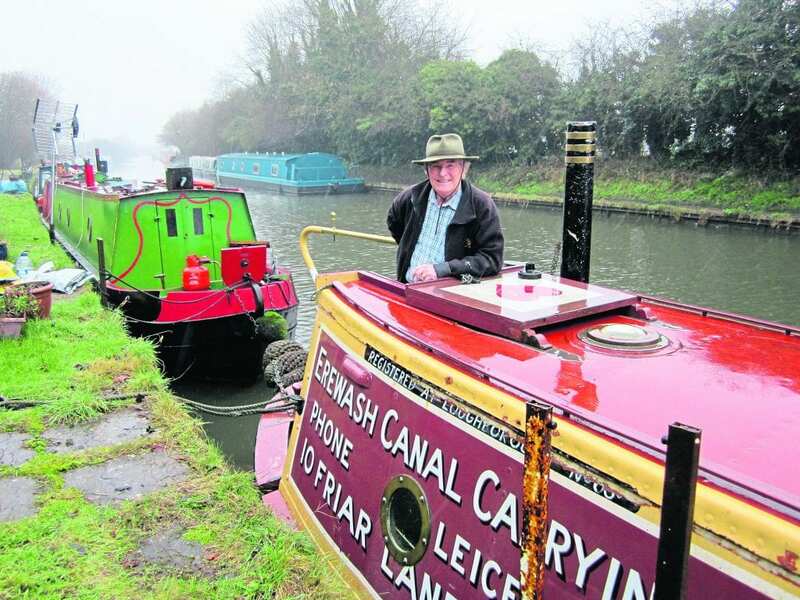 David’s been a regular at Braunston Show – now the Historic Narrowboat Rally – ever since. 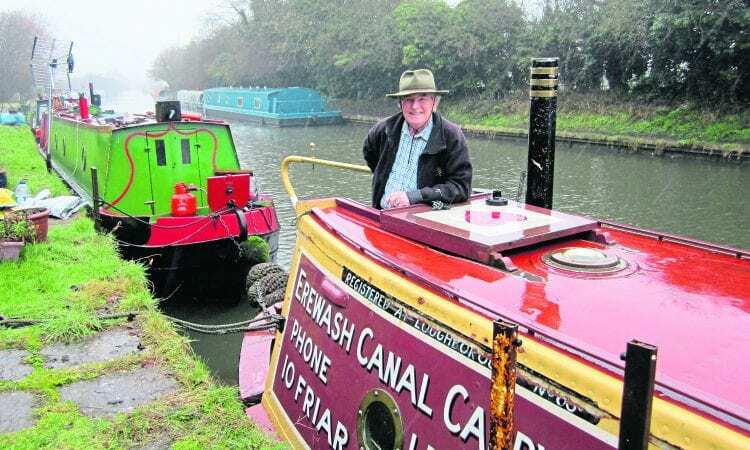 It was on his way there in 1996, through a chance meeting at Grove Lock, that he bought his present pair, Cyprus, and butty Cedar – which he leased for many years to coalman Ivor Batchelor. Built by Yarwoods for the Erewash Canal Carrying Company (of which David is the proudly registered owner), Cyprus was a composite, i.e. iron with an elm bottom. This he eventually replaced when, in 2009, after a prostate cancer diagnosis, he decided more comfort was in order and set about an under-cloth conversion that necessitated a steel bottom to support the new superstructure. 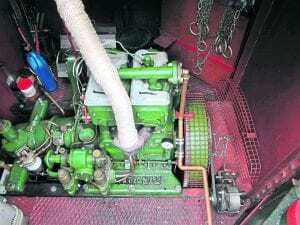 During conversion she was fitted with a National engine, identical to her original one. David has decided views on engines. By the sheer luck that characterises many of his encounters, David came across the grandchildren of George Simmons, Cyprus’ first steerer. 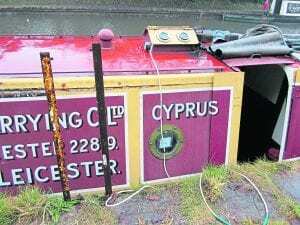 Cyprus gets to most historic narrowboat gatherings, including Little Venice and Stoke Bruerne. David has also worked with Jenny Roberts and her horse-drawn trip boat Iona on the Wey – near his home in Farnham – as a steerer, support boat for National Trust events, and assistant in a film demonstrating traditional horse-boating techniques. If, by the by, readers are wondering whether I should have spelt the boat’s name Cypress, following the arboreal theme set by Cedar and Erewash boats Elm and Ash; photographs show Cyprus is the spelling she was launched with – but not even David knows for certain why.